Running ultras makes you do stupid things. One of these things is entering more ultras but that’s not what I mean. I mean things like deleting the biggest race of your year from your watch because your brain doesn’t work. Yes, I discarded Endure 24 from my Garmin because Endure 24 made me stupid for the day. There’s a saying that if it’s not on Strava it never happened right? Well this did happen and luckily for me other people can attest to that even if my watch can’t. So why did I do this stupid thing now? In all honesty, it was to see if I could do a 24 hour race with a view to trying a 24 hour track race, just to see how I match up. I knew I had the mentality to do it because my best races have been where I’ve switched off and just kept moving. The idea of no navigation and not having to carry loads of stuff also sounded great. But, I knew if I jumped straight into a track race, there was a chance I would utterly hate it. I’ve never even run 100m on a proper track and my body doesn’t like very flat, hard surfaces so this seemed a sensible alternative. The Hardmoors 110 (2015) took me about 25.30 and the West Highland Way (2016) took me 21.35, so I figured that with 24 hours on an easier course with constant support, I could cover a lot more ground. In my head, I wanted about 130 miles and expected to be able to do 120. But when do these things ever go according to plan? 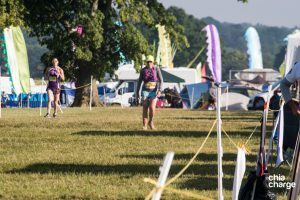 Endure 24 is billed as Glastonbury for runners with camping, music and food. 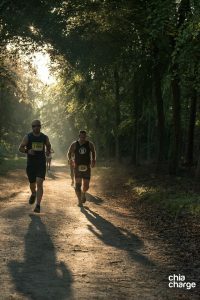 You can run it as a team, a pair or solo and you have 24 hours to do as many laps of the five mile trail as you can or want to. There are marshals every couple of kms and a water/fuel station half way round the lap. Encouraging signs point the way and fairy lights adorn trees and temples through Bramham Park. It was going to be a lovely weekend in the motorhome again with Jayson there to crew for me and Indie as extra encouragement. Unfortunately, the weekend before, Indie had a bad fall and spent most of the week at the vet. After getting him home with a newly fused wrist and feeling very sorry for himself, we decided it was better if he stayed at home. This meant some back and forth for Jayson but at least it was only a 45 minute drive. Surely this was the worst of the luck out of the way! The start was like a city marathon in that we all started moving through a big Mizuno gantry but we had chip timers so it didn’t matter if you walked to the mat. This didn’t sit well with me for some reason, so I ran through the crowd and I’m pretty sure I elbowed some people by accident. It was strange too because people were going at very different paces. The relay runners were really going for it as if they were in a 5 or 10k, whereas some people were walking. I trotted along comfortably, knowing that going even a little faster than that might hurt me a lot later on. 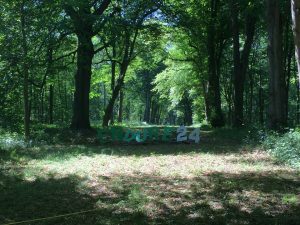 The first kilometre of the course swept down a wide tree lined track with a huge banner style sign at the bottom saying ENDURE24 in big colourful letters. A slight uphill through more woods had us passing the Temple of the Lead Lads, a stone building that signalled the flattening out of the track. Coming out into the open again, if you looked right, you could see the start field in the near distance. A little downhill took us to Temptation Corner, tempting because going straight on would cut off most of the full loop! This was where the V Dub Van was parked for the duration. Two guys dressed like members of Madness danced around to Ska music in front of a black and white VW camper van while doling out shots of what I think were energy drink. They seem to be a fixture at Endure events! 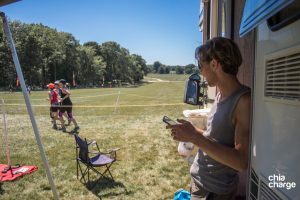 The next exposed little stretch led to the first official marshal point, a simple gazebo with some very enthused ladies and a little boy wearing hula outfits, dancing and cajoling. They kept up the enthusiasm for the whole event which I thought was outstanding. Even when they morphed into blokes… The Deep, Dark Wood came next and was my favourite bit. It was so cool out of the sun and the track became a bit more traily, which didn’t seem as monotonous underfoot. It didn’t last long though and we soon reached the mid point of the loop and the Shambles Café, a water station which also had Clif Shot Blocks. I didn’t stop here and kept barrelling along, down a short incline to the next marshal point, then up a short climb. It was so chalky and bright, I was really glad of my sunglasses. The dust coming off the track was crazy too. Through a little wood and out into the open again, we reached Festival Field, which had seen a Total Warrior event the week before. There were lots of kamikaze sheep here that wanted to be on the other side of the track and were constantly weighing up how to get across without us getting them. The grass is always greener for sheep isn’t it? This was the hottest part of the course, as it was very open for a long stretch, but turning a corner and descending into Dead Tree something or other, we were faced with another giant ENDURE sign on a hill and almost at the end of the loop. A few ripples in the path took us up and through another tree lined path and from there we could see the finish line. But that wasn’t the finish. That was just lap one. 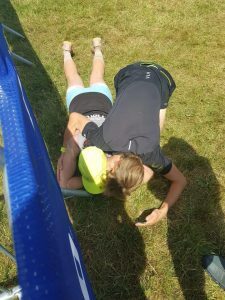 All you can really think about on a race like this – or maybe it’s just me? – is maths. If I run at this pace for this amount of time, I can get this distance by this time. And repeat. And repeat. That’s pretty much how the first 50 miles or so went. It was enjoyable in a weird way, not having to remember where to go or worry about someone getting past or catching the person in front. It’s just you, even though you’re surrounded by people. I saw loads of friends too, all encouraging me and enjoying their day: Jon, Nikki Carr, Anna Seeley, Peter Kidd, Adrian Martin, Brenda Wilkin, Paul Elsley, Serena Meljan, Neil King, Emma Lavelle-Wood, probably tons of others that I just can’t remember! Each time I got back to the motorhome, I would eat a sandwich and/or some fruit, swap my bottles, get Jayson to stick some ice under my cap, a cold pack down my back, grab an ice lolly and go. I was eating well, drinking well and felt pretty good. Time went by really quickly and before I knew it, Jayson was getting ready to go and check on Indie and it was about 7 hours in. I had gone from third lady to first early on but had no idea as we had decided not to even worry about positions until at least this point. 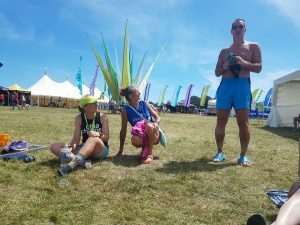 I had seen Brenda and Paul at the water station where we jokingly discussed chafing in the heat, and then the same conversation happened with Nikki. Never having suffered from this before, I became suddenly aware that my thighs were sore. Short shorts are awesome but have their disadvantages when you have athletic thighs and it’s baking hot! A quick change from shorts to skort and I was good to go, although I did notice how much tighter my skort felt. I must have been very puffy and not have suddenly put weight on as my silly brain was telling me! Jayson said goodbye for a few hours and I cracked on, knowing that Chia Charge Chris would be there for me on the next couple of laps. It was starting to cool down a bit now which made things easier and suddenly, cups of tea were appealing. Chia Charge Tim and Lisa made a really welcome surprise appearance too, which was lovely, and Lisa helped me into a long sleeved top for the night section. My ITBs were feeling tighter by now, an historical issue because of my wonkiness, which always makes me think the worst is going to happen. I got Lisa to rub some heat lotion onto my legs too to try and relieve them a bit which seemed to work. They sent me on my way, telling me they would probably be there until Jayson got back. 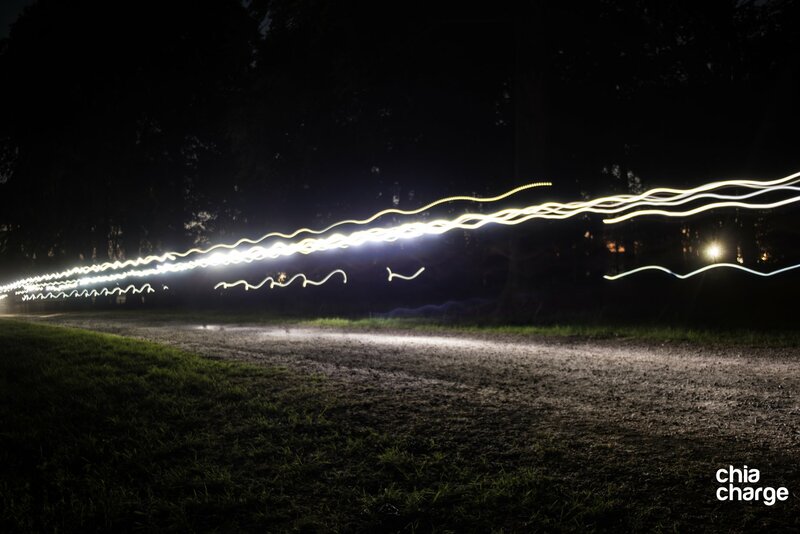 I really enjoy running at night: fewer bugs, cooler, quieter somehow and just more peaceful. 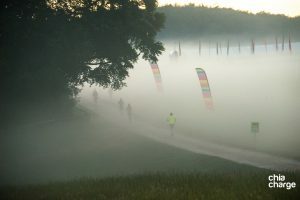 The festival village had shut down for the night, so there was no pounding music, no commentator calling me Kimberley and not as many runners on the course. 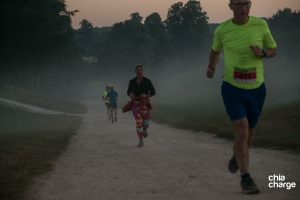 I think several people chose to sleep for some of the night as they were all going faster than me again in the morning! 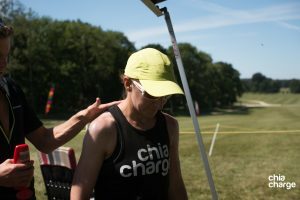 One more heat lotion and tea lap with the Chia Charge crew, and then Jayson was back, telling me that Indie was fine and enjoying some down time without us! It was around this time though – 12 hours or so in – that I started needing the loo after about 4 miles on each lap. Luckily, I could get to the motorhome and use our toilet, and I was still drinking and eating noodle soup, but this really lost me some momentum. Sub 60 minute laps were becoming an hour and 4 or 5 and it happened about four times in a row. We decided I needed some help, otherwise I would become dehydrated and lose more energy than I needed to. On the next lap, Jayson had managed to hunt down some Imodium so after taking a couple, I had no more problems. Music is something that I have used in the past and, by about 1am, I decided to get plugged in. My playlist was honed and ready with some right choons ranging from uplifting Disney music to The Bloodhound Gang to Foo Fighters. More hours ticked by with me lost in my music, a low lying, thick mist enveloping the fields as the sun started to lift. It was like running through a massive fridge going through the mist and looking back at pictures, it was incredibly atmospheric. I just didn’t really appreciate it at the time! That weird early morning feeling started to kick in, when your body is going ‘What the flip are you doing? You haven’t slept you numpty!’ and everything gets very emotional. The latest David Guetta and Sia song, ‘Flames’ came on and I started sobbing in front of some marshals. I felt obliged to tell them it was because I was delirious and I was fine really, then continued on, whimpering and attempting to sing at the same time. It was some time around early morning that I just couldn’t stop peeing too. I would get this urge and just have to go, regardless of where I was. There were several times I had to do it right in front of people as there were no bushes, walls, even rocks to hide behind. One lady did try to save my dignity by standing in front of me, for which I am very thankful. No one really seemed to mind though and I got a couple of Paula Radcliffe comments. So much easier for men! This was another thing that started to slow me right down though, and I was concerned that all the fluid I was drinking was going through me. My feet were sore and every time I tried to run, my legs would not let me. When I started this race, 120 miles had been my minimum target. I had based this on what I thought I could run on a fairly flat course and on other peoples’ results. On Sunday morning, even this looked like it was slipping away. I had to reassess. Other people were saying that at least I was definitely on for 100 but to me, that just wasn’t enough. To me, doing 100 would have been a massive failure. 115 looked realistic but it would probably take me longer than 24 hours. I don’t think I was lucid enough to grasp just what an achievement that would be given the conditions, so even that felt like a disappointment. One thing I did know was that I was absolutely not going to get less than that. Jayson had been doing the maths though and reassured me that even 120 could still be done if I could maintain one hour 15 minute laps. I had to get a march on and get in and out of the motorhome checkpoint as quickly as possible to do it. Just before Jayson went at around 7am and on my 90 mile lap, I managed to save a frog from potentially getting stood on. One of the things I love about trail running is being in nature and sharing my environment with the little fellows that live there. This chap cheered me up a bit, as did another very special lady. Walking over the ripples after Froggate, the hilarious and joyous Serena Meljan caught up to me. She was running as part of a team and had done 40 miles in total. Serena had been on one of our training camps and since set up some really successful ladies’ running groups in her area. I like to take credit for that…. I grumpily told her that all I could do was walk and she said ‘Why would you run?! These people are stupid for running!’ She then proceeded to shout me down the finishing chute, telling me to shake my bum and calling me Kimberley. Not to gush, but she made my morning: you Tempsie Ladies are lucky to have such an awesome leader. Another awesome lunatic came at the right time for me at the end of my 95 mile lap. By now, I was obviously exhausted, I had at least one burst bister that was killing me and I still couldn’t stop peeing. I needed some Steele wisdom. Jon appeared behind me, looking much better than me and on a mission. He still walked with me for a while though and listened to my woes. I was told that I was ace and not to worry about the peeing thing, after all, who really cares if they saw me squatting at the side of the route? They’ve got their own problems. Jon trucked on and I saw him hugging someone at the top of a slope that had become a mountain to me. Katie Kaars Sijpesteijn had come out to cheer me on and was trotting along in bare feet to walk me in. I had heard Jon say ‘Go and see Kim, she needs it’ and this set me off weeping again. Katie got another smelly, damp hug and chatted me through towards the finishing field. She ran on ahead after I told her I had a blister to deal with and I was met by her again with Casper, her husband and their friend Mike, who had all come out on their bikes for the morning. The Kaars Sijpesteijns took charge as I took my right shoe and sock off to reveal a burst blister on my second little toe in and a very dusty foot. Casper said we should just wrap it in KT tape and when he saw that I was incapable of the thought required to do this, he took it off me and sorted it himself. I wanted to stick the scissors in him as it was so sore, but I’m so glad he did it now. He also made me pop another on my big toe and wrapped that up for me. When he suggested we have a look at my left foot, I had to draw the line, as I knew we’d find more horror and I didn’t have the time. I put a new sock on and hobbled back out for my 100 mile lap. Katie walked with me a little, telling me that the pain was all in my brain and it wasn’t real. I may have grunted something back. I didn’t realise exactly how double hard those two were until that moment!! When I got back around, Jayson was back and I had done 100 miles in just over 20 hours. My laps were taking about one hour 15 but I was stopping for too long. I wasn’t going to make 120. I resigned myself to 115, finally took off my long sleeved top and replaced it with my vest, and went out once more. By now, more and more people were congratulating me and geeing me on. The word ‘thank you’ became ‘ankyee’. The marshals’ effervescence became a background hum. The undulations became Lakeland fells. Each step was a fresh torture. Mile 105. Drink, eat, suncream, go. Mile 110. 11:07am. 43 mins on the clock. As long as you were back and off on your last lap by 11.59, it would count. The commentator announced that I was the winner of the ladies’ race but if I went one more time, I would also break the course record. What else to do but keep marching? I had a bit of a mental second wind here – more like a light breeze really – and decided I would get my power walk back on. I was determined to finish looking better than I felt and quicker than the last pitiful lap. As I approached the Ska bus one last time, bam, another blister went. It felt like my foot was on fire and I ground to a standstill. I loosened my laces and tottered down the little slope, then thought it might be worth taking my shoe off. It wasn’t. I put it back on again, undid both sets of laces and resumed an even slower walk than before. Maybe the hula marshals would have a plaster? They searched, bless them but couldn’t find one, so I kept trucking, chomping on the Kendal Mint Cake Katie had left for me. When I reached the Shambles café and saw the ambulance, I thought about asking them to dress the blister, but what would that take? Five precious minutes? I kept moving. Dozens of ankyees later and I was on the approach to the rippling bit when Roy McDougall pulled up alongside me. I have never really spoken to Roy at length before but it’s in moments like these when you realise there are some people that just get it. He looked around conspiratorially and said quietly, ‘Just between you and me, you are flipping awesome’. Except he might not have said flipping. Sorry Roy, I know it was just between you and me, but you are flipping awesome for saying that too. You would have thought I could have mustered a little jog across the line, but no, spent doesn’t even cover it. I walked across the line to loud cheers and all the glory, found a spot to the side and laid on my face. Kristy and Keith Wise had appeared with their two crazy pooches and managed to capture the moment brilliantly. I do love a good lay down. After a few minutes on the ground, Jayson decided we should move and we went to seek out my medal. An angel at the medal tent provided me with a chair and a bottle of water and we waited for the prizegiving. I suddenly came over all tearful, probably at the realisation I didn’t have to do another bloody lap, and had another little weep. We weren’t quite close enough to the prizegiving area, so I abandoned the chair and hobbled over to a big map of the course where it was being held. It was great to win a race that was on quite a large scale and was completely unknown for me. I knew I could do well in local races and some low key events but this was a totally new experience. Plus, I won some cool new shades! Love a bit of swag even more than a trophy. What was really nice was being awarded the 100 mile club tshirt with about 20 others. All of those people had gone there with the intention of doing something extraordinary, and that we did. Although, there were only three ladies that did it: come on ladies, believe in yourselves and get training! The Long Walk to the motorhome was probably more difficult than my last lap. It’s odd how you can get your body to do so much but then when your head knows it’s over, your body isn’t taking any more of your nonsense. I laid in the back, looked at all the Facebook messages – thank you! – and promptly fell asleep. Jayson filmed me sleeping because my feet were twitching as if they were still walking! They were taking Sia’s and S-Club 7’s sage advice: don’t stop moving. In the days following the race, I was really unhappy with the outcome. I know, it seems absurd but when you put everything into a race, you make compromises and you work really hard but still don’t get what you want, it feels like a disaster. I was happy with the position and the record, and I knew I couldn’t have done anything more over those 24 hours, but the fact I didn’t get the distance grated on me. Could I have done anything differently in the build up? Was I just not good enough? In an ideal world, I would have done more running, but I was at my personal limit in training, so maybe really what I need is more experience. This type of race is much more to do with mental strength and I know I have that. I got my head down and did it, no messing, but is that always enough? There is a lot to work on for the rest of this year and I am forming a plan to get me to become the runner I want to be. For now though, it’s time to get back to the trails I love, do some races for fun and think about what I really want in the next few years. Fat legs and chilling with friends. What it’s all about. So much went right but some things could have gone better! I ate and drank really well with Precision Hydration once again playing a massive role in keeping me hydrated. I think the tummy problem – which was never really bad – was an inevitable consequence of the battering I was getting. 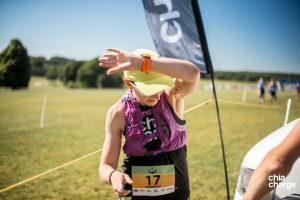 It was nothing like I have had in the past, so I can only conclude that the combination of heat, lots of ice lollies and running for ages made it happen. I went with Hoka Speed Instincts in a men’s 6.5 which were really close to my size 6 ladies Hoka Challengers, but a bit wider. I think I should have used the Challengers first and then changed into the Instinct though, as they were a lower drop and lower to the ground. Maybe I would have had fewer blisters that way? Hard packed terrain does not suit my gait at all. Repetitive surfaces are one of the reasons I suffered with ITB issues when I started running, so I either have to do something about my movement patterns or not run on it anymore! What went well was my mentality and ability to get into my robot zone. I can’t explain it or work out how, but sometimes, I just get into business mode and time and miles fall away. I think that if you decide to do something and know that you will do it, then it just happens. The whole logistics of the day were perfect. Having the motorhome for frozen and hot stuff was brilliant as was having it parked right on the course. My pack was great too. It was a small Montane race vest with no back to it but two small pockets at the side and two at the front, as well as pockets for two 250ml soft flasks. It worked well because I had to carry a bit of food and definitely water on such a hot day, but a bigger pack would have been overkill. The event itself was fantastic too. Doing it as a team looked like so much fun! The support was amazing, the organisation slick and the event village looked great. Speaking of support, this was definitely a team win for me! My coach Edwina Sutton was brilliant at understanding what my limits were in training but still working me hard enough to get a result, even when she had her own serious stuff to contend with. Thanks Eddie! The Chia Charge folks are constants for me now and I don’t know what I would do without their lush flapjacks and nut butters. And the actual ground support they supplied, especially Chris. I know you love witnessing this mad stuff Chris, but you helped more than you know. Thank you to Katie, Casper and Mike for coming out to see me too. I was a bit of a shed at that point and you got me what I needed, even though it hurt! And of course my lovely husband Jayson. We had a lot going on that whole week and he made it so easy for me just to focus on the race. I hope I can do the same for you soon. Thank you and I love you! Thanks too to Jon and Shirley for being our campsite buddies, and to all of the other runners who Endured! Same again next year?! Great read kim. You are awesome and an inspiration. Well done on smashing it.